I’m kicking off my Cultivating Character series with the one trait hits closest to home: flexibility. I’ve never been good with change or spontaneity. I’m a schedule-and-routines girl through and through. Something as small as moving our clocks back an hour (as we did last Sunday. . . sigh) can throw me off for months, and there is nothing I dread more than a last-minute invitation or alteration in plans. Embarrassing true story: last Mother’s Day I hosted a brunch for my family, and a night-before addition of a seventh guest nearly led me to cancel the party altogether. The ordeal led to an abundance of hurt feelings, and my overreaction is certainly not one that I’m proud of. I admire those who are unfazed by the unexpected and are able to graciously adjust their plans, expectations, and timelines to accommodate others, but this is regrettably not an area in which I excel. <— Understatement of the year. Unfortunately, there are few things in life as constant as the unavoidable fact that things will change. As much as I would like the rest of the world to fit into my highly structured box of predictability, this is simply not possible, nor is it necessarily desirable. Though I’m loath to admit this, change can actually be a good thing. Without change, there is no improvement, no growth, and (particularly pertinent for me) no opportunity for character development. I think that accepting this simple fact is the first step towards becoming a more flexible individual. Rather than expending energy in a futile effort to resist the change, I can find peace in resigning myself to its inevitability and simply working to go with the flow. A similar strategy I’ve contemplated to help me stretch my flexibility muscles (how’s that for a pun?!) is to be transparent about the fact that change is hard for me. When faced with a circumstance that demands adaptability, it’s easy for me to feign nonchalance while inwardly stewing about being “inconvenienced.” Rather than keeping my feelings to myself, I think it will be helpful to openly admit to myself and others involved that I am struggling with the change. Then, rather than using my inherent rigidity as an excuse, I can ask for the help and support I need in stepping out of my comfort zone. It’s never easy to admit one’s weaknesses, but as long as such candidness isn’t used as a crutch, it usually leads to mutual understanding and, ultimately, to personal growth. 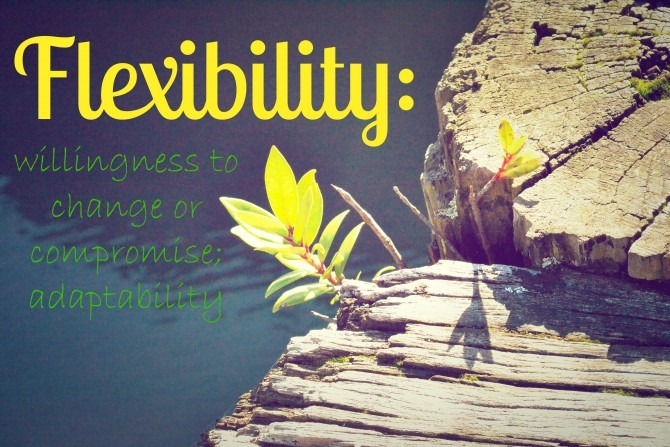 Finally, I hope to improve my personal flexibility by harnessing change for good. Last fall Luke and I did this in a very tangible way: we had been wanting to shift our sleep schedule so that we’d be going to bed and getting up an hour earlier. We decided to make the change at the end of Daylight Saving’s Time, and the shift went seamlessly. A year later, we’ve been able to keep to our hour-earlier schedule, all thanks to a calendar-mandated change that I generally loathe. I would love to transfer this skill to other areas of my life, viewing dreaded changes in a more positive light. With the fast-approaching birth of our son, I foresee a great number of changes in my future, and I am choosing to have an optimistic mindset about them. I know that this enormous life change will not be easy, but I am certain that benefits will outweigh the challenges, and I can’t imagine a better training regimen for flexibility. 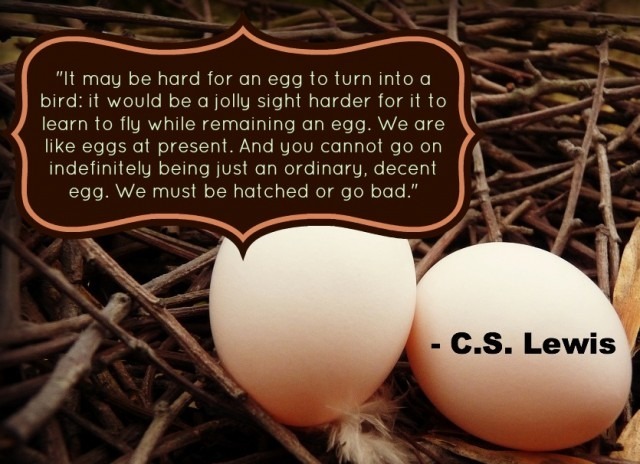 Hatching from an egg. . .talk about having to be flexible! It’s never easy to be stretched in an area of personal weakness, but recognizable progress in such an area can be particularly sweet. Last year I had a teaching assignment that required me to step on out of my change-free comfort zone on a weekly basis. While I fought these “growth opportunities” at every turn, my increasing adaptability did not go unnoticed. At our end-of-year awards ceremony, my boss publicly commended me for demonstrating flexibility with my students and coworkers throughout the year. It was one of my proudest moments, and a powerful reminder that I am not only capable of being flexible, but that it makes life more pleasant for me and for everyone else involved! As this trait is clearly something I struggle with, I’d love to hear from you: are you adaptable by nature or, like me, is this an area you need to work on? What strategies have you utilized to help you cope with change? Please share your thoughts in the comments! And if you have any recommendations for articles or books that address this topic, I’d love to know about them!